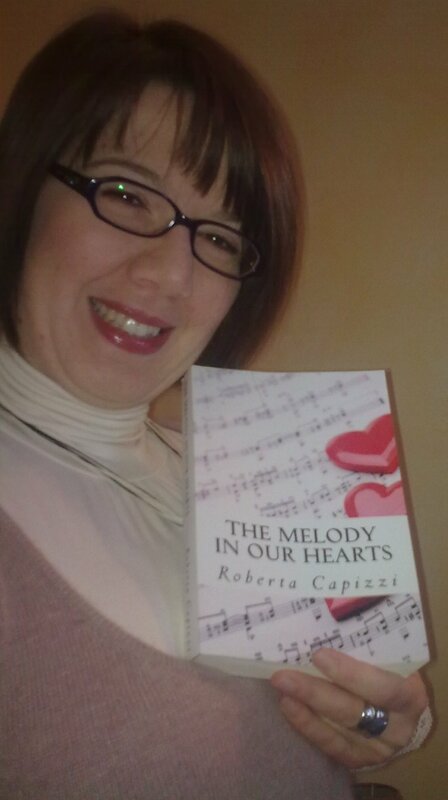 As a member of the Melody in our Hearts blog tour, I have the pleasure of presenting my readers with a sneak peek at author Roberta’s Capazzi’s contemporary romance novel. This post includes a giveaway so make sure to read along for more info. The ebook version of The Melody in our Hearts will be available for 0.99 from March 18, 2013 to March 24, 2013. 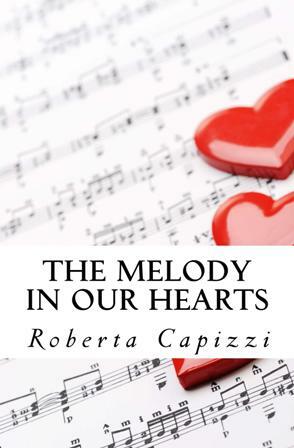 The melody in our hearts: A story about the value of true friendship, the power of dreams, and the unpredictability of love. When Valerie accepted to fill in for Dr. Moore on a rainy Wednesday night, she would have never imagined she would be faced with her two biggest fears: losing her best friend and walking into an operating room, both in one night. It was close to midnight, and it had been a very quiet night so far, which was weird for the ER of a big city like Boston. However, she had to admit she was happy about it. She hadn’t been too pleased to find out, when she had been called in at the last minute to replace Dr. Moore, that she was the only surgeon in the ER that night. Ever since she lost that patient on her operating table six months ago, she had never been able to walk into an operating room again or pick up a scalpel. Just the thought gave her the creeps and was enough to cause her to have severe panic attacks, which was why she had asked to be moved to the ER, where she wouldn’t have to operate or be anywhere near an operating room. Everybody knew that, so why hadn’t they called someone else to fill in? Were they playing some kind of psychological game with her mind, hoping some bad casualty would be brought in, and she would be forced to go back into an operating room? Well, there was no way she would; they could forget it. Her surgical career was over, and nothing would ever make her change her mind about that. She had spent the last forty minutes in the office behind the nurses’ desk, checking patients’ records and thinking of the lovely dinner in a posh restaurant she had given up when she had taken the call. Her best friend, Ryan, had come back to Boston the night before after being away for almost two months on a long European tour, and he had invited her to dinner, wanting to tell her everything about the places he had been. It had flattered her that Ryan had invited her instead of his gorgeous girlfriend, and she was glad that, in spite of who he was now and whom he was dating, their friendship was still as important to him as it was to her. She had missed him so much; ever since he had become a celebrity and started traveling around, she always felt as if a piece of her heart went away with him wherever he traveled. She never felt complete until he came back, but he had never been away for such a long time before. It had been really tough on her. She decided to send him a text message, suggesting making dinner for him tomorrow night, but she had barely managed to write a couple of words before the doors to the hospital opened and two paramedics rushed in, pushing a stretcher with a man on it. She sprang up and ran to them, followed by Sharon, one of the elder nurses. When she reached them, Adam, one of the two paramedics, updated her on the patient. The word rang in her head like an alarm bell: That man needed a surgeon, and she was a surgeon after all, but she knew she would never be able to operate on him. Adam was surprised. He had heard about what had happened a few months before, when she had asked to be moved to the ER; nevertheless, he would’ve never thought a doctor could really refuse to save a patient. Most of all, he would’ve never thought Valerie would be capable of such a thing: He had seen her at work, and she was great at what she did; seeing her hesitate like that just didn’t seem normal. A wave of nausea and dizziness took hold of her body, just at the thought of being forced to walk through those doors and pick up a scalpel. She leaned back against the door frame. Two nurses rushed toward them, ready to assist her with the patient, but when she turned back, they noticed the expression on her face and the fear in her eyes, so they both froze in place. “Sharon, call Doctor Walker!” Valerie shouted, panic-stricken, and Sharon stared at her in disbelief: Doctor Walker was a neurosurgeon and lived only five minutes away, but it wasn’t close enough. She could see the man needed immediate surgery, and they couldn’t afford to waste any time. Sharon flinched at the tone of her voice: She had known Valerie as a surgeon for quite a long time now, from when she was still working in the higher wards, and she had never seen her lose control, not even under the most stressful circumstances. She had always thought that Valerie would make a hell of a surgeon; she was one of the few doctors she knew who had taken up the job as a mission, as a way to help people and save lives, rather than just a way to get money. But now, as she was standing there, her back to the paramedics, she looked like a scared puppy. Sharon was almost tempted to take her in her arms and pat her back soothingly. Valerie shook her head, taking a step back away from Sharon and closer to the stretcher. Her legs started to shake, and she had to lean against the stretcher for support; she just couldn’t operate and risk losing another patient on her operating table. One had caused enough trouble in her mind, and she was still trying to come to terms with it. Then, as she looked down, she noticed the man’s hand sticking out of the blanket, and she saw a ring on his right ring-finger. The vision took a few seconds to register, but when its significance reached her brain, her blood went cold and drained from her face, while her legs suddenly turned into jelly. It was a Celtic ring, their ring. The symbol of their friendship they had bought together so many years ago, before Ryan had moved to Boston, and which he considered his lucky charm. The same ring hung from a silver chain around her neck, together with the shamrock he had bought her at Tiffany’s on her twenty-third birthday. She instinctively touched it, feeling it under her scrubs. “Oh my God,” she whispered, as she took a better look at the ring on those long, pianist fingers. It couldn’t be him; there must be someone else who wore the same ring, who had the exact same beautiful hands. She immediately moved closer, and for the first time since he’d been brought in, she looked at his face, half-hidden behind the oxygen mask. It all seemed to happen in slow motion. The paramedics and nurses temporarily disappeared, and when she removed the oxygen mask from his face for a second, tears welled in her eyes and her legs gave in. “No, no, no, no!” she screamed, and when Adam grabbed her, seconds before she collapsed, she turned back and held onto him as if she were about to fall off a precipice and he was the only one who could save her. Tears started flooding her cheeks, and Sharon rushed to her, trying to understand what was wrong, and started stroking her back. “What’s the matter, Valerie? Do you know him?” Sharon asked, although she presumed it must be so. “He’s… my best friend,” she whispered, her voice cracking. Valerie shook her head, as her whole body was shaken by sobs, and she turned to Sharon, feeling like a child seeking comfort in her mother’s arms. “You will if you keep waiting for someone else to come and operate on him, Valerie, can’t you see?” Sharon’s tone was soft but had a firm edge now, and it somehow helped Valerie to regain control of herself. Valerie sobbed, and suddenly the whole situation felt unreal, as if she were living in a sort of awful nightmare: Ryan was fighting for his life on a stretcher, there were no other surgeons on duty, and she was the only one who could do something to save him, but she was too scared. She had lost a patient, and she had given up on the surgical career forever, but if she didn’t do something now, if she didn’t manage to get over her fears, her best friend, the most important person in her life, would probably die, and she would regret it for the rest of her life. Would she be able to live with that horrible guilt? But what if she operated on him, trying to save him, and she killed him? Would she be able to live with the remorse of having killed him? She wondered what would be worse: Ryan dying because she didn’t have the guts to pick up a scalpel and do what she had studied so hard for, or Ryan dying after she had done whatever was humanly possible to save him? Sharon’s voice shook her out of her reveries, and she took another look at Ryan, lying almost lifeless on that cold stretcher, his face covered in blood and scratches, his skin turning paler as seconds ticked by. No, she couldn’t watch her best friend die because of her cowardice, knowing that she could have done something if only she had been braver. Everyone immediately followed her orders, and when she met Adam’s eyes and saw his approving smile that indicated his faith in her, she suddenly felt she had made the right decision. A minute later the whole team was in the operating room; Delia ran in holding the ultrasound machine, and Valerie immediately checked the situation. It looked bad, but she knew she could fix it if they all worked quickly enough. She put on her lab coat, surgical cap, and white latex gloves and took a long, deep breath. As she expertly made an incision on her best friend’s skin, she wondered what her life would’ve been like if Ryan hadn’t been part of it: Would she be a doctor now? Would she still be in Ireland, or would she have moved out anyway? Would she be the person she was now, or would she still be the shy teenager who never seemed to fit in? No, her life just wouldn’t have been the same without Ryan, and it would mean nothing without him now. With her hands stained in her best friend’s blood, she began reciting a rosary, praying to God that her knowledge would be enough to save Ryan’s life. It was when she discovered novels by authors Rosamunde Pilcher and Maeve Binchy in her teenage years that she realized it was time she put down in words the stories she had kept well hidden in her mind until then. What started as a hobby, soon turned into a real passion and a way of life, until she could no longer keep the stories to herself, and decided to get over her fears and share them with the world. She is already working on a second novel, while jotting down ideas for more as they pop into her mind. Will be available through Barnes and Noble/Smashwords soon (April/May 2013). A 10$ Amazon gift card.